Double Chocolate Oatmeal Cookies — urban. apron. 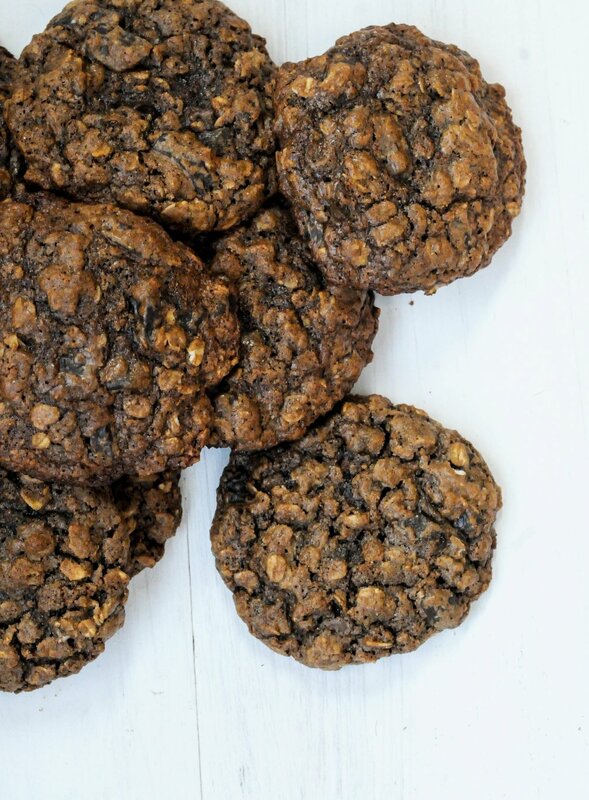 This recipe is like a really good double chocolate cookie and an oatmeal cookie smashed into one. Okay, that’s exactly what it is. The name pretty much gives it away. Also… I have a confession to make. As much as I dislike when people rant on social media about being busy. Lately, it’s been very busy over here. Busy to a point where I cannot gather any meaningful words to write on this space for you. I should probably tell you something deep and personal, maybe share a story or a lesson. Because every recipe has a story right? But for some reason nothing even comes to my head. How do I connect a double chocolate chunk cookie recipe to a life lesson? This tired, busy, worn-down new mom HAS NO IDEA. I’m going to cut myself some slack today. And this recipe is a good one to do that with. Because it actually came about when my husband requested cookies and I only had a little more than a 1 stick of butter. So I melted it, stirred in oats and cocoa and made a chewy double chocolate oatmeal cookie. And it WORKED. So maybe this post does have a lesson: We work with what we have. And we are often surprised at how good it can be. Mix the butter and sugars until well combined. Stir in the eggs and vanilla. Mix in the flour, cocoa, baking soda and salt until combined. Stir in chocolate. Bake for 9-10 minutes and let cool on wire rack.